At the very least this modern remake of the classic BBC sitcom Dad’s Army cannot be accused of lacking effort. Unlike so many cash ins of beloved IP there’s a palpable sense of passion surrounding this project, you can genuinely feel the respect that both the cast and the crew have for the beloved television series that ran for nine series over a nearly ten year period. Unfortunately that only gets you so far and passion alone does not make a movie and this flat, and ultimately pointless, remake proves just that. Though it of course borrows character names, traits and a few iconic lines (though not as many as you’d expect) Dad’s Army does spin its own yarn instead of merely relying on tales already told in the original series. It’s a smart decision because when the movie resembles the television show most closely is when it flaws are most apparent, it’s impossible not to compare this big screen adaption to its inspiration and it simply doesn’t remotely stand up against such a classic of the small screen. The narrative on offer largely revolves around a journalist coming to Walmington-on-Sea to write an article about the Home Guard, with several members of the platoon getting smitten with her in turn. Matters are further complicated by news of a German spy within the town and it becomes the job of the bumbling Captain Mainwaring to discover their identity. Aside from a far too action heavy finale it’s a plot that feels befitting of the Dad’s Army name, and of the films many faults its broader narrative framework isn’t one of them. So what is the film’s biggest crime then? Well it’s a simple case of it being utterly dull, thanks in part to some extremely poor casting. The original series often revelled in the mundane and celebrated British fortitude which this movie attempts to emulate but far too often it simply comes across as downright boring. Most of the film’s jokes simply don’t land, or are so painfully obvious that you’ll find yourself groaning in favour of chuckling, screenwriter Hamish McColl has done a frankly awful job of translating the comedy stylings of Dad’s Army to this cinematic adaptation. It’s a shame that original series creators Jimmy Perry and David Croft couldn’t have had a hand in writing this. Casting Dad’s Army must have been a thankless task, finding actors that could measure up to the original ensemble would have been basically impossible however even when considering that the performances are still truly disappointing. Toby Jones is a dull Captain Mainwaring, not quite nailing the arrogance and pompousness of the troops often clueless leader, Bill Nighy seems bored throughout, except when he’s supposed to be romancing Catherine Zeta-Jones in which case he becomes uncomfortably cringe worthy, this isn’t the endearing and soft spoken Sergeant Wilson that you remember that’s for sure. Blake Harrison is probably the most successful of the cast as Private Pike, but that’s largely due to the fact Harrison is really good at playing slightly dim. The absolute worst of the bunch is however Tom Courtenay as Corporal Jones who manages to take arguable the most beloved character in the Dad’s Army cannon and make him so dull and lacking in personality that it’s borderline impressive, if it wasn’t so insulting to such a great creation. Michael Gambon as Private Godfrey, Bill Paterson as Private Fazer and Daniel Mays as Private Walker are all just as unimpressive as the rest of the cast. 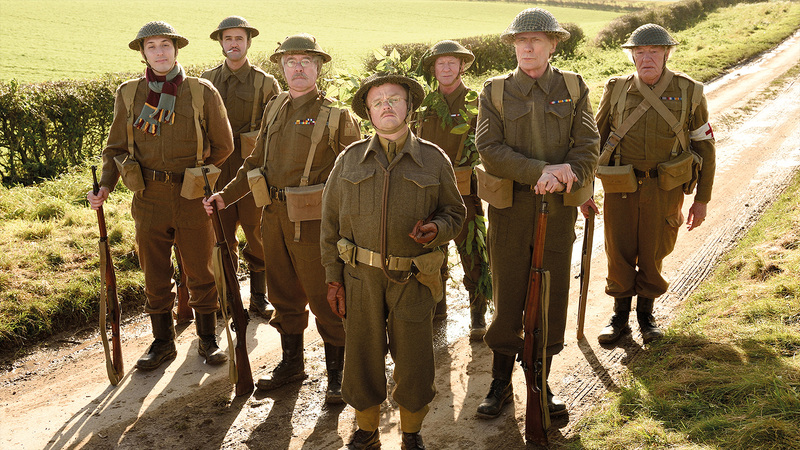 The initially fears and scepticism surrounding this big screen remake of Dad’s Army were well warranted, this modern day adaption is lightyears away from the quality of the original television series, it lacks the strong cast, hilarious writing and compelling characters that made the show such a hit. Maybe those that haven’t been watching Dad’s Army will find something to enjoy here but they’d be far better off simply watching the original series instead and those who have already had the pleasure of meeting the Home Guard of Walmington-on-Sea should steer well clear. Next articleDoes the rise of English mean that knowledge is being lost?